You're probably already aware of Yu's Garden. Me, I'm just getting acquainted. Although it is next door to Tapioca Express, Liang's Kitchen, Kaju Soft Tofu, Chef Chen's, J. Sweet Bakery and 101 Noodle Express, I have not, until recently, stepped into Yu's. In fact, I've been every single one of those other restaurants, some of them more than a few times. Others I even reviewed for The Weekly. But Yu's Garden was, for all intents and purposes, invisible. I ignored it, shunned it, never even considered it an option. Boy, was I missing out. I finally tried it after a co-worker mentioned it was his regular takeout place. This alone did not convince me. It was only when he said Yu's levies about $7 for a three item combo with massive amounts of well-prepared food that I stopped ignoring and became a kind of regular myself. He was right. For exactly $7.08 Yu's will pack on a movable feast into groaning foam containers. The place is about instant gratification and not paying much for it. Most everything you want to eat is ready-made, but all of it fresh, and with that mom-cooked flavor and character. The cold dishes are presented in deep platters; the hot ones in chafing trays. This is not Panda Express. There is no Orange Chicken or even Kung Pao. Instead there is chicken mousse wrapped in deep fried tofu skin. There is bone-in basil chicken in sauce-lacquered pieces you have to navigate carefully with your teeth to eat. And soy-simmered minced pork, the kind that you top rice with. And mapo tofu that harbors stinging hot peppers hiding between the custardy curds. When I ordered the latter, I almost thought they were making a mistake. They ladled the stuff into a quart-sized container until it was practically full. Any place else would have slopped it on into the same foam container as the rice. Not here. They are intent on giving you more than you expected and paid for. (The non-soupy items do get put into the same box container your other items). I've returned a few more times since, especially for the stir fried veggies. I like their hearty stalks of Chinese broccoli; the invigorating bittermelon; and the simplicity of stir fried spinach and mustard greens. But most of all, I come back because of the value. In a town without a lack of cheap Chinese food, Yu's isn't just the cheapest, but probably the best of the cheapest. There will be a time in the future when pho will be embedded into the food vocabulary of every American just like pizza and tacos is today. Since we are fortunate enough to live in a county that includes the highest concentration of Vietnamese outside of Vietnam, it can be argued that pho is already part of our everyday lexicon. I don't know anyone who doesn't know what pho is. Do you? And with the continual proliferation of pho restaurants beyond the borders of Little Saigon, you are closer to a pho restaurant than you think. I had no idea there was one on a street that I practically traverse on a daily basis until one day it popped up on the GPS when I was actually looking for another pho joint. The grime on the windows suggest that Pho Crystal Noodle House has been there on Bristol Street for quite a while--at least as another pho joint. The artifacts of its former life as Pho Bistro is still on an old marquee the landlords hadn't bothered to change. Apparently it recently changed hands because they're still in that honeymoon period where they give out free bowls of che dessert to every customer. But for all intents, the menu looks no different than what it probably was under the last set of owners. Pho is featured in all the usual permutations; rice dishes and crispy noodles fill in the rest; and then there's the hu tieu, which, if you've read this blog long enough, is what I usually order at pho joints...yes, call me a rebel. This one is just as lovely as all that I've had before. I opted for mi for my noodle, thin yellow strands that still had a nice al dente chew, and there were more shrimp in the bowl than my picture would suggest--at least two more. But there was also more char siu, those indispensable slices of red food-colored Chinese BBQ pork that's become the workhorse of soups like this. Mine was particularly meaty, with a flavor that's unmistakably pig. And there was slowly wilting lettuce and, most important of all, a broth clear and sweet, like sugar was involved. A squeeze of lemon rounded it off and bubbles of fat--possibly leeching out the piece of fried chicken they dropped in there--skittered and gleamed on the surface of the liquid. Yes, I did say fried chicken. Pho Crystal Noodle, apart from being the restaurant that seemingly popped out of nowhere, is also the first Vietnamese joint that I know of that offers a piece of fried chicken in its soup. You gnaw it at first by trying to grip the thing with your chopsticks; but then later, you go to town with your hands. To eat it without licking your fingers is impossible...which is the point of fried chicken, I think. You may have noticed from recent posts that I've been haunting the OC Mart Mix like a loiterer, as if nothing else has been going on in the OC food scene. It's not that I'm necessarily obsessed with it; it's just that it seems the current epicenter of interesting eats. People have called it the new The Camp. I'd have to agree. The concentration of the eclectic and the unique reminds me of it. But at the same time, it's also different since it's mostly an indoor swap meet maze not unlike those at LA's Garment District, but kookier and a lot more hipster. Most people congregate to OC Mart Mix for Portola Coffee Lab. Me? It'll mostly be for N'Ice Cream. This diminutive gelato counter makes one of the best flavors of ice cream ever: salted caramel. The color is of rust. You'll know it's the most popular flavor here, trumping even the Greek yogurt drizzled with real honey, because it's almost always about to run out. It's the salt that makes it great, zapping your tongue like a fully-charged defibrillator, shocking it from stasis like no ice cream has done before. After that, the rich and calming caramel comes, slowly subsiding as it melts and dissolves down your gullet. It's a spoonful you'll want to repeat, again and again. In fact, every other flavor you try after you lick up the salted caramel will taste as dull as plain milk, sort of like a typical strip mall compared to the OC Mart Mix. Really? 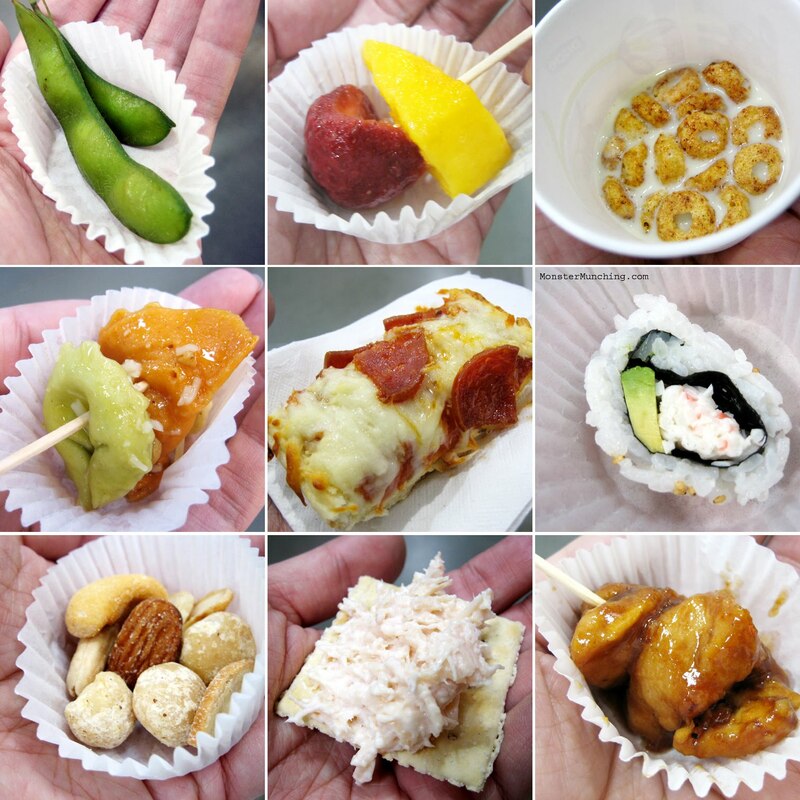 Am I really about to blog about Costco samples? Yes, Virginia, I am. If you consider this as this blog’s “jump-the-shark” moment, I will argue with you that the shark was jumped many moons ago. Next week, I might just start talking about grilled cheese (if you know what that’s in reference to, consider yourself a seasoned food blog follower). 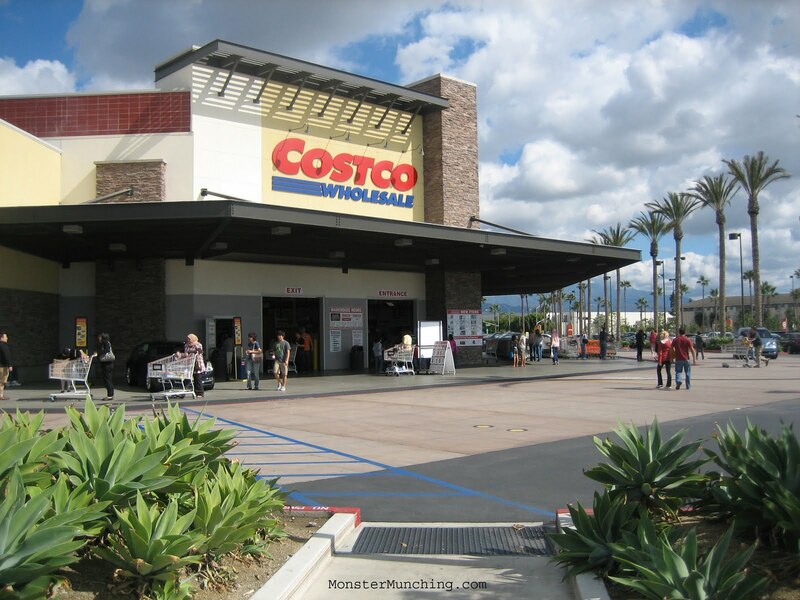 But admit it: if you’re a Costco member, you relish zig-zagging through the aisles picking up a taste of this, a nibble of that, a sip of something else—all for free. It is in our nature as economic creatures to be cheapskates, to gravitate to things that we can get for nothing. Even The Simpsons, the most reliable mirror on our culture, had an opening sequence parodying our collective but unspoken love of free samples. As soon as I get in the store, those stations appear in my peripheral vision as if they glowed white hot under night-vision goggles. I make a beeline to them like a pig trained to root out truffles, or a divining rod to water. Some of you will rightly point out that sampling isn’t actually free. You fork over the yearly membership, so you’re technically paying for the experience. And as a selling tool, it works. Costco wants you to take full advantage, because they know the more you taste-test free samples, the more likely you are to buy a whole year’s supply of GoGurt. Never in a thousand years would I have believed that the Harris Ranch pot roast would be any good until I took a sample. Now I buy it almost regularly. And hemp seeds? They taste rather good. Am I going to buy a whole sack? Not really, but I’m glad to know what they taste like. It goes the other way too. Though it should be common knowledge, I can confirm from sampling that the sushi rolls should be avoided. The rice is more like gluey paste. To make this post somewhat useful for those of you who still think this blog could be useful, here’s a piece of Costco trivia that I bet you didn’t know: To find out whether your favorite item is about to be discontinued, look for an asterisk or a plus sign on the upper right hand corner of the price label. Any item with a price that ends in a “7” is also likely to become history. If you see any of these indicators on a product you like, you’ll know that that’s the time to buy the year’s supply. Next week, another post, another shark to be jumped.